Thank you all once again for your partnership and fantastic Christmas donations of food, gifts and money in December and throughout 2017. We received over 1700 referrals between our two Food Banks in 2017, and put out over 130 extraordinary food hampers, gifts and toys in the Christmas week alone. It is a blessing to us all in seeing what can be achieved in our own communities when the people of God work together. Thank you for all the effort everyone puts in to make this ministry work. We look forward to what the Lord is going to do in 2018. April 2018 will mark the third anniversary of the opening of the Village Food Bank at the Parish Church and we are delighted have forged such close links with the Bethlehem House of Bread, which operates out of Cornerstone House. The Food Bank in the Village is open each Friday from 11am – 12.30pm. This year, Cumbernauld Old Parish Church will be supporting Fairtrade Fortnight when we will be inviting people to ‘Come On In’ and see what Fairtrade is all about. Put simply, Fairtrade is about ensuring producers and workers in the developing world get better prices and decent working conditions; it therefore supports local sustainability and fair terms of trade. Many women have old handbags lurking at the back of their wardrobes, either used or waiting to be used ‘some day’. Cumbernauld Old might just have the solution. Between now and 4th December we will be collecting for the Lanarkshire Baby Bank Christmas Handbag Appeal. We would invite you to join the Handbag Appeal by donating a handbag and fill it with some of these suggested items, things that we all take for granted but most of the mums this charity supports struggle to buy: toothbrush and toothpaste, deodorant, wipes, shampoo, conditioner, brush, comb, bobbles, lip gloss, nail polish, moisturiser, sanitary products, soap, hats, gloves, fluffy socks, razors, hand sanitiser, mouthwash, chocolate and sweets. Elizabeth Snedden and Anne Morrison will co-ordinate the donations and will be happy to receive handbags and any of the items on the list for this local charity. There will be a box in the church vestibule at the Village and in the Forge hall at Balloch for your donations of handbags, items on the wish list, or both. Thanks for your help. It will make a big difference. You can find our more about the Lanarkshire Baby Bank on their Facebook page. Having supported the Cornerstone food bank for some time with weekly food donations from our congregation, Cumbernauld Old Parish Church decided to offer additional help in the form of a satellite food bank in our area too. Thus with the support of our friends at Cornerstone, the Village food bank opened its doors in April 2015 at the Session House in the Village. The Cumbernauld Village food bank is open in the church Session House on Friday mornings from 11 – 12.30 to provide not just food and toiletries but support and a welcome for some of the most vulnerable in our community. Advice can be given regarding courses on basic cooking and budgeting as well as providing information regarding other agencies who may be of help. An important function is to provide a relaxed friendly place where people can come to share and chat over a coffee and feel valued. 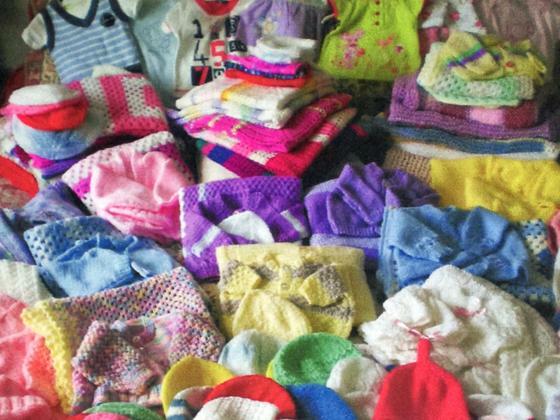 Knitters in the congregation are invited to help themselves to wool from the basket in the vestibule at church or at the back of the hall in Balloch to knit items for baby bundles for this charity. Any form of baby clothes would be appreciated – don’t worry about dark colours – or six-inch squares to make blankets. More information can be found in our church newsletter. Thanks a million to Margaret Robinson for her kind donation and to Elizabeth Snedden and Anne Morrison.